If you are like me, you may not have heard of Arc’teryx before. They are an outdoor clothing company based out of North Vancouver, British Columbia in Canada. Their name and logo refers to the Archaeopteryx Lithographica, which is the first reptile to develop the feather for flight (something to bring up at your next trivia night). Their parent corporation is the Salomon Group, which has built up quite the following in the outdoor sports world. The company was founded in 1989 by local climbers whose goals were to create equipment that enables a person to be immersed in the moment no matter what the conditions are. Arc’teryx also believes highly in environmental stewardship, responsible manufacturing, and community engagement. 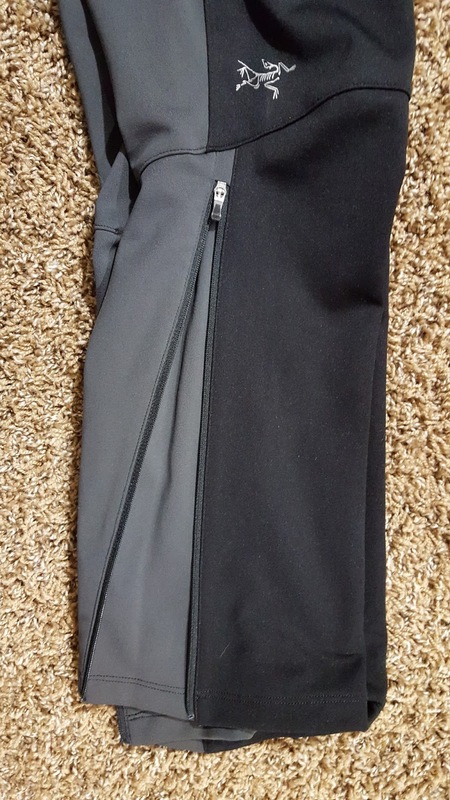 I recently tested three products including the Norvan jacket, Trino tights, and the Calvus visor. 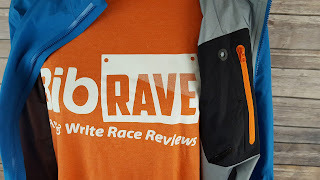 I have tested waterproof jackets from Salomon, Outdoor Research, and Ultimate Direction in the past. A friend of mine just got the Norvan jacket from Arc’teryx and I really liked the way it looked and felt. I was thrilled to have the opportunity to test it out. The first thing I realized when I first got it was how well it was constructed. All of the seams were well taped and the 3-layer GORE-TEX® felt extremely comfortable. You didn’t get that stiff feeling that the older GORE-TEX® coats had. 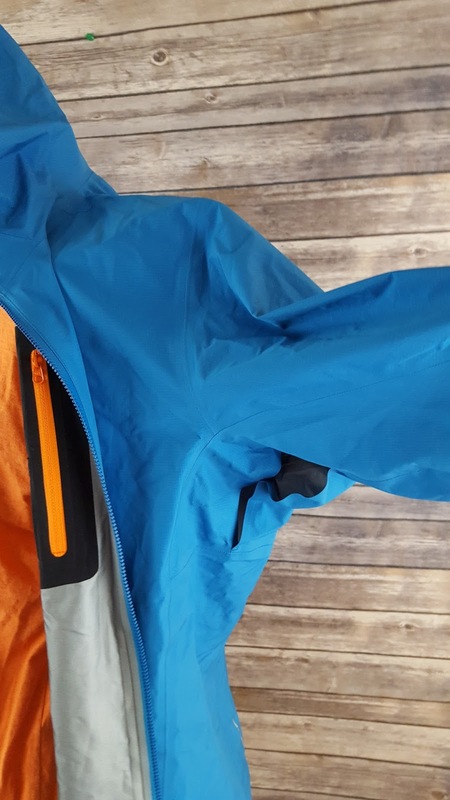 Arc’teryx describes the Norvan jacket as an “Ultra minimalist waterproof breathable GORE-TEX® protection for high output activities in wet, windy weather.” It weighs a mere 7.6 ounces and has a trim fit. There are three color options, Adriatic Blue, Black, and Vermillion (Reddish Orange). 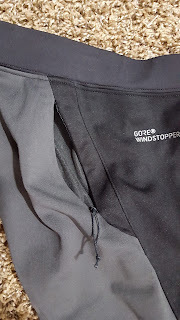 It’s made to keep out the wind and moisture while still remaining breathable. The Norvan jacket uses the patent-pending 3-layer GORE-TEX® fabric with GORE® C-Knit backer technology. You get all the protection, with plenty of comfort. There are two layers of GORE-TEX® that are bonded to a dense, extremely thin circular knit layer to make a less bulky jacket that is not only comfortable, but slides easily on and off over other clothing layers. This jacket was designed with performance in mind. The hood is fitted to provide protection and has an elasticized brim for extra protection. There are air vents that pull air through openings under the arms and provide constant air flow, reducing heat buildup in the jacket while you are running. 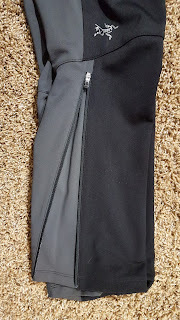 The WaterTightTM front zipper has a quiet, soft pull that is easy to operate. There is also an internal waterproof pocket that is laminated and has a port for your headphone cord. That way you can keep your phone or MP3 player in the pocket and run the cable out without subjecting your device to water damage. The arm cuffs and bottom hem are elasticized to keep the jacket in place. The arms are shaped, which is great since you don’t run with straight arms and there is extra coverage to keep rain off of your hands. There are several reflective logos and stripes on the jacket as well to make sure you are seen in low-light situations. The Norvan jacket is easily cleaned in the washing machine (warm water and double rinsed). As with almost all athletic gear, do not use fabric softeners and remove them from the washer immediately. You can tumble dry the jacket on medium heat. In my test runs, it was pouring non-stop and none of the rain made it in the jacket. The vents worked fairly well and I did not overheat. With any waterproof jacket, you will sweat more than with a water resistant jacket, but you won’t get drenched by the rain. It does a great job and I really like the fit as well as functionality of the jacket. The hood was perfect and really stayed in place, which has been a problem with some of my water resistant jackets in the past. I also like not having to worry if my phone will be damaged from the rain, thanks to the waterproof interior pocket. All in all, this is an excellent jacket. The Norvan jacket is available at the Arc’teryx website for $349.00, which includes free shipping. 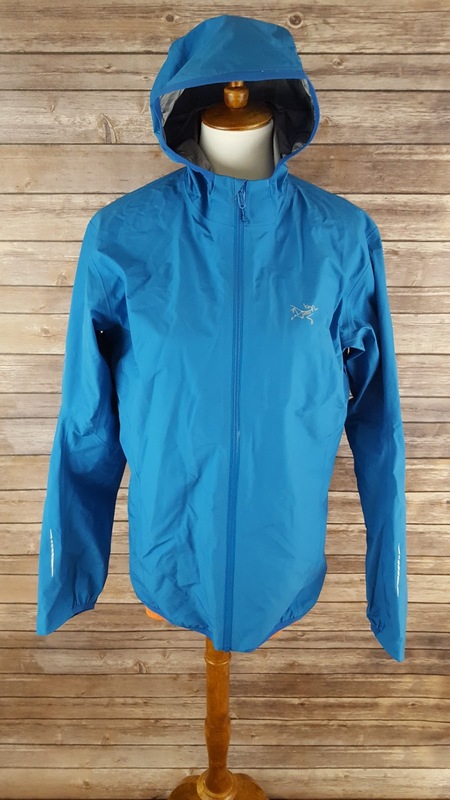 I have seen the same jacket at REI for around $245 and at there are a few places online under $200. It’s a jacket that truly protects you while keeping you feeling comfortable. While the price tag is up there, the quality is amazing and should last for a very long time as long as you follow the care directions. This would fall into the “you get what you pay for” category. The Trino tights are made with GORE® WINDSTOPPER® and is made for training in windy, cool and damp conditions. They will help you in your fast-paced adventures whether you are on the road or trails. These tights combine the protection of GORE® WINDSTOPPER® with the air permeable stretch performance of AtreusTM. They put the GORE® WINDSTOPPER® on the front of the tights to focus on wind proofing and water resistance. The back of the tights have the AtreusTM to improve temperature regulation and provide a great fit. There is a 9” zipper at the bottom of each leg with gusseted fabric inside to make the lower legs tighter (more like a tight than a pant) while still being easy to take on and off. There are two small hip pockets for gels or keys as well. And the tights are designed with articulated legs so they fit and move better with you during your entire gait cycle. 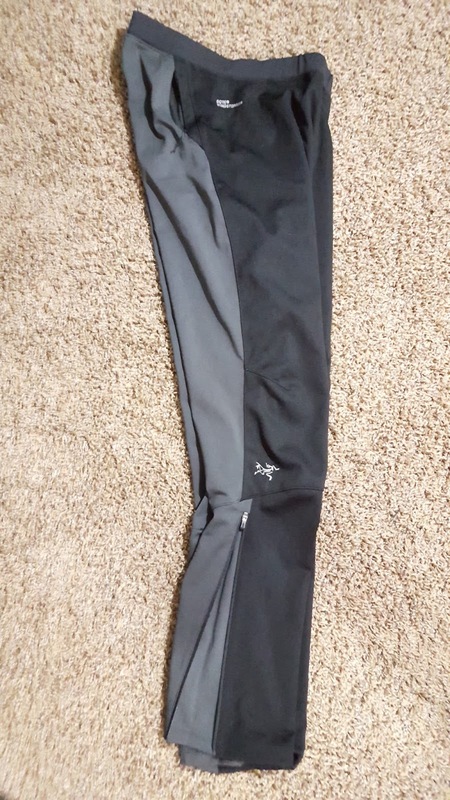 I was extremely pleased with the comfort and functionality of the Trino tights. They do an awesome job of keeping the wind and moisture out. 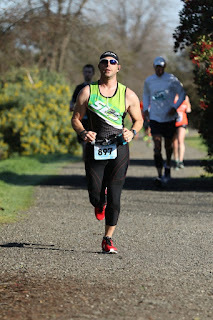 There were 15-20 mile an hour winds, and I couldn’t even feel it on my legs. Even with the extreme rain, my legs stayed almost completely dry, which I didn’t really expect. The Trino tights are available at the Arc’teryx website for $149.00, which includes free shipping. 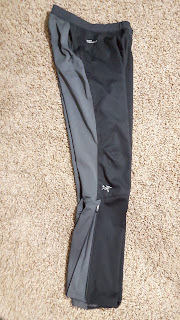 I have seen them at REI for around $100 which is a great price for windproof/water resistant tights. Just like the Norvan jacket, the quality is amazing and should last for a very long time as long as you follow the care directions. 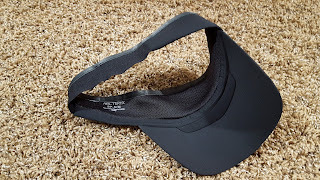 My friend asked me “A visor is just a visor right?” I’ve noticed that certain visors have better fit and functionality than other visors. The Calvus visor is a lightweight technical visor that not only protects you from the sun, but does an awesome job at wicking moisture away. The brim is made of a foam insert to hold its shape without adding weight or bulk. The fabric is made with SocoraTM polyester and is light and air permeable. Weighing in at only 1.2 ounces, it has a barely there feel. The SpacermeshTM band wicks moisture away quickly too. 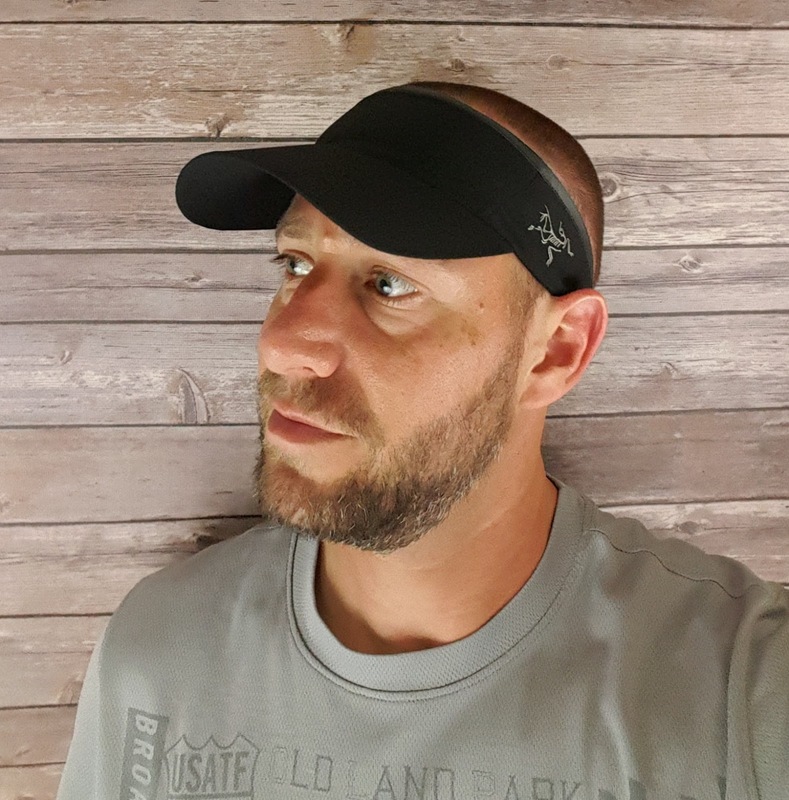 The elasticized rear headband provides a secure fit and there is a reflective logo on the side for low-light situations. 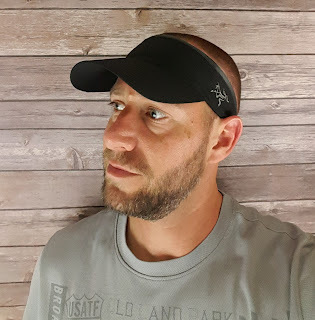 I love the fit and feel of the Calvus visor. It performs well too and it has become my favorite visor. The price tag is great at $29.00 on the Arc’teryx website which is the same price everywhere else online. Arc’teryx makes some amazing products. While some of their products have a higher price tag, I think they are worth the extra money. 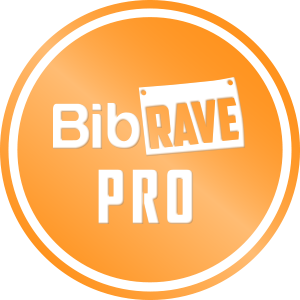 I am a strong believer that paying a few extra dollars on a product that will make your hours of running more enjoyable is more than worth it, especially if the gear lasts for quite a while. I love my Arc’teryx gear and highly recommend it. If you have tried any of their gear out, drop me a line and let me know what you think.